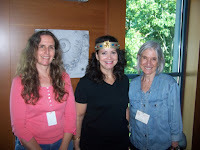 The Michael C. Carlos Museum at Emory University hosted a program for kids this past Sunday based on my book. 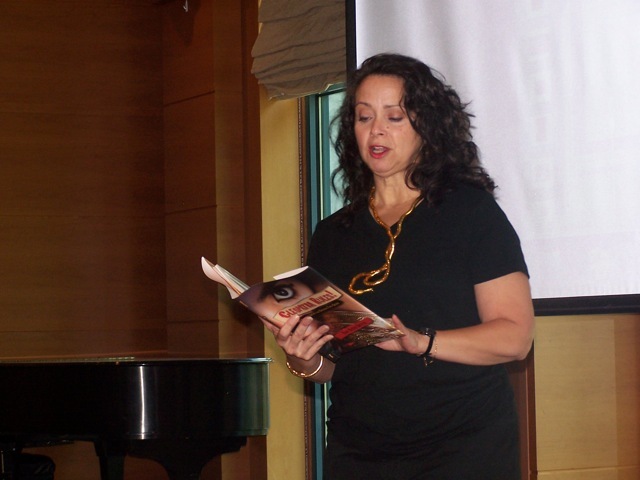 We started off with a short reading and discussion. Even though there was a great age range (3rd to 9th grade! 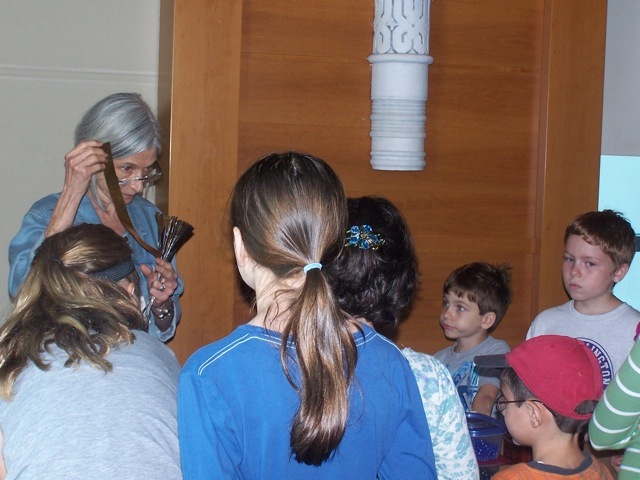 ), I was impressed by the kids' knowledge and interest in the ancient world. After questions, we scooted down to the galleries where I gave a private tour for the group of enthusiastic kids (and some of their parents) of our Ptolemaic artifacts. The mummies, of course, are always the star attraction! However, the kids seemed to really enjoy the conversation about scarab beetles (aka, dung/poop beetles) and their significance. The younger ones couldn't stop giggling when I told them this was their only chance to say "poop" in the museum without getting in trouble. Needless to say, the mummy room echoed softly with the word as they got it out of their system (not literally, of course). 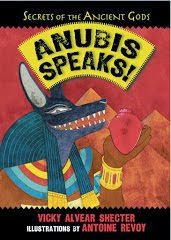 The older kids enjoyed learning about Anubis and the Weighing of the Heart test. All seemed curious, engaged and appeared to have a great time. After the tour, it was back upstairs to make crowns and diadems. 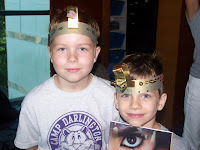 Fellow docent Robey Tapp led the kids in this extremely creative project that involved gold poster paper, cut gold-foil (many times thicker than aluminum foil) for the snakes, stick on jewels, brilliant markers, and lots of beads. 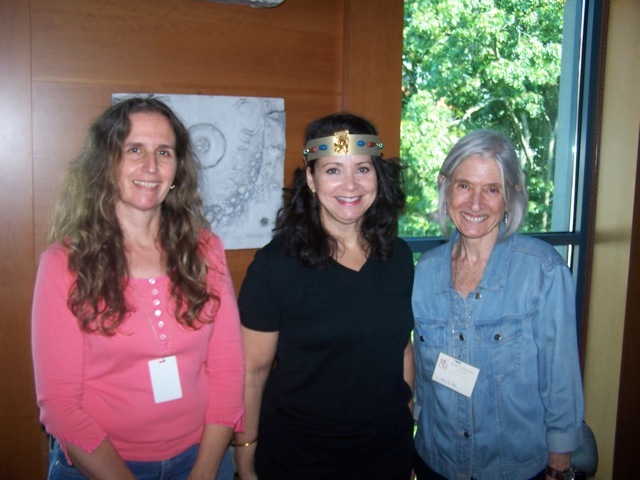 A big thank you to Nina West (left), Robey (right) and the museum's Education Department for hosting this wonderful event! 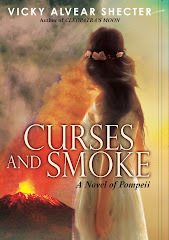 could win a free copy of Cleopatra Rules! for yourself or your school. Sounds like a thoroughly successful event, Vicky! 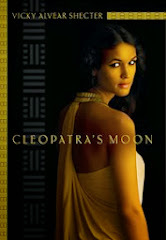 I'm really enjoying the book and look forward to hosting you and Cleopatra on my blog soon. 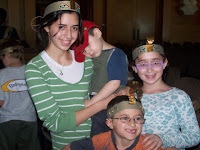 So wonderful to see kids having fun learning about history. Well done Vicky! It's magical experiences like that which shape kids' lives. Darn, wish I had been in town! I would have loved to be with a group of kids talking about poop....actually loved be in your workshop. Oh wait....I am in your workshop at WIK! Will we talk about poop there too? Gail, I'm glad you enjoyed the poop references (hmmm--what does it say about you? Actually, what does it say about me since I'm the one who started it!). Thanks Robyn and H for the support! 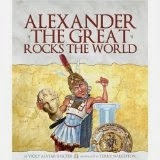 Now if I could just convince the people hosting the Cleopatra exhibit that my book and program would be good for them!